Middle school students are not only capable of complex reasoning and critical thinking, but they are also passionate and eager to learn about the world around them. While some may view the middle school years as challenging, we recognize this point of life as a pivotal opportunity to guide our children in becoming well-rounded, optimistic, and compassionate young adolescents. As educators, we have immeasurable influence in the lives of our students. We are devoted to creating a safe, productive learning environment where each student is valued, supported, and encouraged to ask questions. We want all our middle school students to have confidence in themselves as learners. We desire to effectively prepare our students for high school and beyond. At ICS, we understand that every student is uniquely created by God and learns in a different way, so we use a variety of teaching strategies and lessons to reach each child. We model and teach our students to pursue excellence every day for the glory of God. We also challenge our students to use their strengths and academic knowledge to serve and benefit others in our school community, nation, and world. We believe that every person is created in God’s image for a purpose. Our middle school faculty is honored to partner with families and community members as we work together to guide our young adolescents through these critical and exciting years. ICS follows the Common Core State Math Standards for all math classes. 4. Developing understanding of statistical thinking. 4. Drawing inferences about populations based on samples. Algebra 1 is a high school level math course. Students who successfully complete this course can earn high school math credit. This course reviews the real number line and operations with real, rational, and irrational numbers. It introduces polynomials, functions, and factoring, as well as the Cartesian coordinate plane with an emphasis on linear equations and modeling. Geometry is a high school level math course. Students who successfully complete this course can earn high school math credit. This course is a study of definitions, theorems, and postulates of geometrical figures such as parallel lines, circles, triangles, quadrilaterals, and other convex polygons. Includes use of the compass, straight edge, and proofs. In the Middle School at ICS, we have two classes dedicated to English/Language Arts: Literature & Composition and Spelling & Grammar. Literature & Composition focuses on the reading and writing portions of the Common Core standards. Students engage in reading a variety of texts, such as novels, poetry, short passages, and informational text, as well as writing in a variety of forms, such as informative, persuasive, narrative, while using the writing process and the traits of writings. Each year in their writing, students should demonstrate increasing sophistication in all aspects of language use, from vocabulary and syntax to the development and organization of ideas, and they should address increasingly demanding content and sources. Spelling & Grammar focuses on the language portion of the Common Core standards. The focus for instruction is to help ensure that students gain adequate mastery of a range of skills and applications in the conventions, mechanics and usage of the English language, gaining in complexity each year. More information is available at corestandards.org if you wish to look in depth at what students will learn at each grade level. In order to meet the needs of the transient student population, ICS has chosen an integrated approach to science, wherein each year students will have an opportunity to learn from each of the areas of science: life, earth, and physical. In addition to an integrated approach, we foster curiosity, honesty, open-mindedness, and skepticism while teaching the students to how to think like a scientist and use the scientific method. Every other year, students get the opportunity to explore the scientific method in depth as they take part in the middle school science fair, preparing and presenting a project of their choosing. Discussions of controversial topics that are typical in science classrooms are conducted with those attitudes mentioned above (curiosity, honesty, open-mindedness, and skepticism) while maintaining ICS’s core value of Biblical worldview. The standards ICS uses for Science were developed in-house, using McREL, AERO, and select states as a base for where we wanted our science program to go; this allows us to be academically relevant and hold to our core values. 6th Grade — Students explore the nature and classification of living things, rocks and minerals, properties and changes of matter, electricity, and magnetism. 7th Grade — Students look deeper at the living things through the study of cells and cell processes, respiration and excretion, cell reproduction, animal behavior, human development and heredity. They also explore the nature of light and sound, waves, space, and a more detailed look at the properties and changes of matter. 8th Grade — Students examine the human body as a living thing, exploring the various body systems, delve into the world of matter at the atomic level, learn about the periodic table as an introduction to chemistry, and experience the laws of motion as a foundation to physics. The content for each grade level is used alongside the conceptual standards discussed below that together give students a greater understanding of social studies, culture, and history allowing students to be knowledgeable, engaged members of society who go on to live well-rounded and productive lives. 6th Grade — Students learn the importance of geography as they study the countries in the Eastern Hemisphere and the Americas. 7th Grade — Students take a journey through history as they explore Ancient Civilizations. 8th Grade — Students are exposed to US History from exploration to the start of the nation and through its first few hundred years. The standards ICS uses for Social Studies were developed in-house, using National Council for the Social Studies, AERO, and select states as a base for our social studies program; this allows us to be academically relevant, as well as culturally relevant, and hold to our core values. 6th Grade -- As students transition into adolescence and the turmoil that can follow, we desire to give our students a foundation in Biblical Wisdom. Students are guided through a study on the book of Proverbs, learning the characteristics of wise and foolish men. 7th and 8th Grade -- Students embark on a journey through the 66 books of the Bible. This two-year study gives a great overview of the story of Salvation as it unfolds from Genesis through Revelation. ICS follows the SPARKS curriculum Standards for PE. It is essential for middle school students to participate in physical education as they are growing and developing at an intense rate. Students in ICS will have PE classes every other day. 7th Grade -- Students will be refining their skills, building new ones, and increasing their focus on applying skills in modified team sports settings. Fitness remains a focus as students work towards improving physical fitness. 8th Grade -- Students focus on skill-refinement, skill-application, and games strategies. Fitness continues to be a focus as students work towards improving physical fitness. Students choose to participate in two electives each semester. Electives offered will vary each year. Please see the Middle School Program to see which electives are being offered this year. ICS middle school students are assigned a Chromebook to be used in their classes. The Chromebook is a learning tool, not be used during lunch or break, but only under the supervision of classroom teachers. Students are not to bring their Chromebooks home. It is important for our students to learn how to appropriately use technology and become digital citizens. By keeping the Chromebooks at school, we are giving the students’ parents the authority to control their child’s time spent in the digital world. Students will collect their Chromebook from their homeroom each morning and return it to their homeroom for charging each afternoon. Meaningful Student Engagement: We offer 1-to-1 computing to make school more engaging and relevant for our students and to support meaningful and challenging work. 21st Century Skills: We will ensure that students have high level 21st century skills which will prepare them for a successful future. Project-based Learning Opportunities: Through personalized, authentic, and collaborative experiences, students will solve problems and demonstrate their learning through project-based activities. Middle school is a time of great social growth as students begin to look for direction from their peers and world around them. 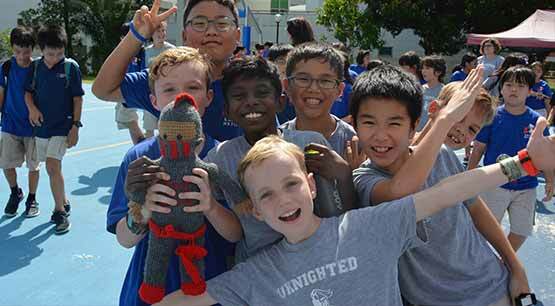 ICS provides opportunities for our middle school students to develop socially in a positive manner. As an international school we also want our students to develop a global perspective, seeing beyond the borders of Singapore and their passport country so that they can be equipped to impact the world for God’s glory. International Night: A huge celebration exploring the school community’s cultural diversity and celebrating God’s creativity. Field trips: Throughout the school year classes may visit museums, factories, historical buildings, and other places that pertain to the current course of study. Student Council: Each year students have an opportunity to apply and be chosen for the Middle School Student council. As leaders of the classes, the SC sponsors and host different activities like Shoeboxes for India, See You at the Pole, movie and dance nights. ECAs (Extra Curricular Activities) & Sports Clubs: After school activities and clubs offered by teachers and parents to enhance the interests of our students in different non-academic areas. Some of the courses are Robotics, Dance, Service Club, cross-country, Bowling, Ukulele, Creative Writing, basketball, soccer, and Badminton. Elementary Buddies: Being a school with junior kindergarten through seniors on the same campus, provides wonderful opportunities for mentoring and friendship across the grade levels. Every other week during Bible class, middle school students visit a lower elementary classroom to spend time with the elementary buddies where they spend time reading, working on projects, and completing crafts with their elementary friend. Advisory: Every Monday, Wednesday, Thursday, and Friday, we have a 35-minute class period for Advisory time. We’ve designed our advisory time to provide all students with dedicated time for reading (for pleasure) and consistent opportunities to get targeted support or learning extensions with teachers - essentially a place for students to “get what they need”. Advisory days are built around the following schedule: M - silent reading; W/Th - W.I.N (What I Need - student- or teacher-directed learning extensions and learning support; F - Service Groups. Indonesia Service Trip: Students may have the opportunity to be part of our Indonesia service team. This team travels by boat to an Indonesian island to serve a local school or village. Over the multi-day trip, students complete a community development project by painting, digging, or building and teach various lessons in the school. The goal of this trip is to give middle school students the opportunity to think beyond themselves and serve others.